Homeowners, tenants and businesses should be aware of the dangers posed by heavy snow loads on roofs and the warning signs of potential structural weaknesses. In some instances, the risks posed by accumulated snow on roofs can be mitigated by safely removing snow from roofs of both commercial buildings and homes. Flat and low pitched roofs, most often found on industrial buildings but are also used in certain home designs, are at the greatest risk of buckling under heavy snow and ice accumulations. Lower roofs, where snow accumulates from higher roofs are also vulnerable. Consider hiring professionals to do the job. The combination of heights plus ice makes this one of the more dangerous maintenance tasks. If you don’t hire professionals, have someone outside with you in case anything does go wrong. 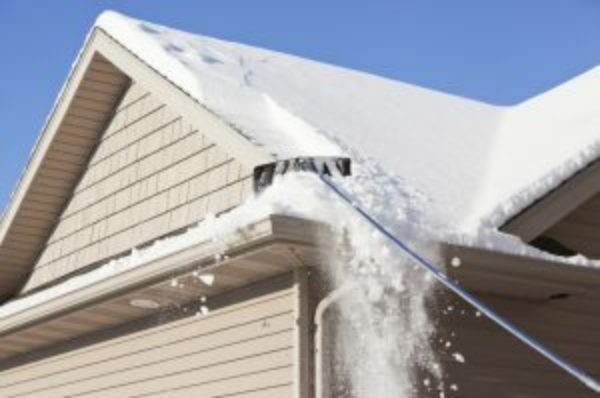 Use a telescoping snow rake for pitched roofs (available at most hardware stores) to remove snow from your roof. Keep in mind metal tools conduct electricity if it touches a power line, stay well clear. Wear protective equipment when performing any of these tasks. Keep gutters and drains clean, free of ice and snow and keep downspouts clear at ground level.